Logo of Baker Hughes. Image available on the Internet and included in accordance with Title 17 U.S.C. Section 107. Photograph, Picture of Howard Hughes Sr., inventor of the Hughes Rock Bit. Image available on the Internet and included in accordance with Title 17 U.S.C. Section 107. BAKER HUGHES. Baker Hughes, Incorporated, in the mid-1990s the leading producer of rock-drilling bits in the world, was formed by the merger of Hughes Tool and Baker Oil Tools in 1987. 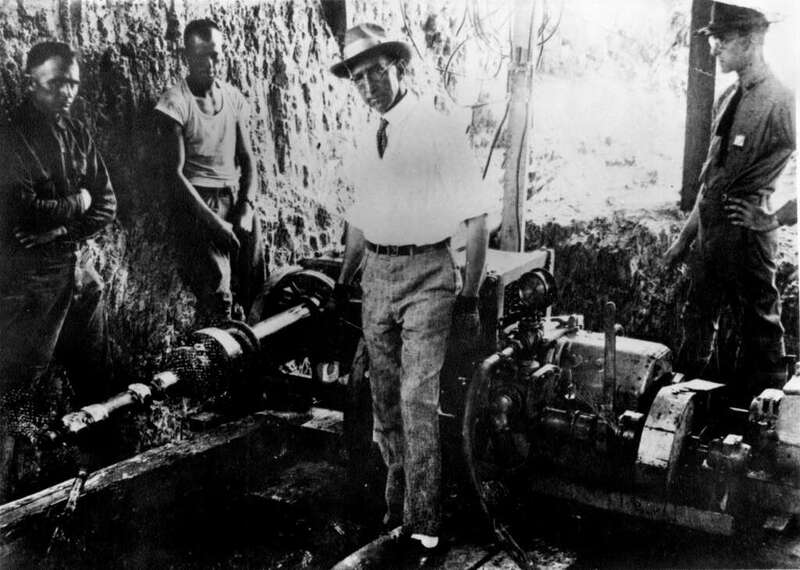 Howard Robard Hughes, Sr., an early Texas oilman, solved the problem of drilling for oil through rock by developing a drill bit with cone-shaped revolving cutters and steel teeth capable of pulverizing rock. He patented his inventions in 1909, and the Hughes Rock Bit revolutionized the well-drilling process. In 1909 Hughes and Walter B. Sharp formed the Sharp-Hughes Tool Company and opened a plant in Houston to manufacture the bit. When Sharp died in 1912, Hughes took over management of the company, which he incorporated as Hughes Tool. In 1918 Hughes purchased the remaining company stock, which had been sold by Sharp's widow to Ed Prather. Hughes continued to improve on his bit and maintained a near monopoly in bit technology by patenting every part of the bit and by buying the patents of competitors. He held some seventy-three patents when he died in 1924 and his son, Howard Robard Hughes, Jr., took over control of the company. During his dramatic career as film producer, aviation pioneer, and Las Vegas casino entrepreneur, the younger Howard Hughes drew on Hughes Tool as a source of investment income. In the 1930s he pursued his interest in aviation by forming the Hughes Aircraft Company as a division of Hughes Tool. Over the years a number of Hughes Tool executives, including Noah Dietrich, Chester Davis, Raymond Holliday, and Bill Gay, played leading roles in managing Hughes's extensive and varied empire. In 1972 Hughes sold the tool division of Hughes Tool to the public and renamed his holding company Summa Corporation. Hughes Tool continued to prosper through the 1970s and expanded into the field of aboveground oil-production equipment. The company suffered from declining revenues and expansion-related debt by the mid-1980s and in 1987 merged with Baker Oil Tools. Carl Baker, a drilling contractor, had founded the Baker Casing Shoe Company in California in 1913 to profit from several of his oil-tool inventions. He began to manufacture his own tools in 1918 and expanded into national and international markets in the 1920s. He formed Baker Oil Tools in 1928. The company prospered with the growth of domestic drilling operations from the 1930s through the 1950s. It dramatically increased its foreign sales in the 1960s and purchased a pumping-equipment company, Kobe, in 1963. Baker Oil Tools diversified into mining-equipment production in the late 1960s and early 1970s, and purchased Reed Tool, an oil drill bit manufacturer, in 1975. The company earned more than a billion dollars for the first time in 1979, but fell in the mid-1980s on hard times that led to the merger with Hughes in 1987. Photograph, Picture of the front of Baker Hughes Incorporated office building. Image available on the Internet and included in accordance with Title 17 U.S.C. Section 107. Baker Hughes, with its headquarters in Houston, consolidated and trimmed operations and was able to make a profit by 1988. In 1990 the company purchased Eastman Christensen, a leading manufacturer of directional and horizontal drilling equipment, and in 1992 added Teleco Oilfield Services, another leader in the field. In 1992 Baker Hughes had sales of more than $2.5 billion and almost 20,000 employees. The company was divided into three operating groups: Baker Hughes Drilling Technologies, Baker Hughes Production Tools, and EnviroTech. Donald L. Bartlett and James B. Steele, Empire: The Life, Legend, and Madness of Howard Hughes (New York: Norton, 1979). The Texas 500: Hoover's Guide to the Top Texas Companies (Austin: Reference Press, 1994). Handbook of Texas Online, Mark Odintz, "BAKER HUGHES," accessed April 21, 2019, http://www.tshaonline.org/handbook/online/articles/dobkh.